The other week my CSA basket came with a beautiful bunch of radicchio. A couple of days went by and I still hadn’t figured out what to do with it. That evening I just happened to open my Bon Appetit, went to my favorite column (written by Molly Wizenberg), and what did I find? 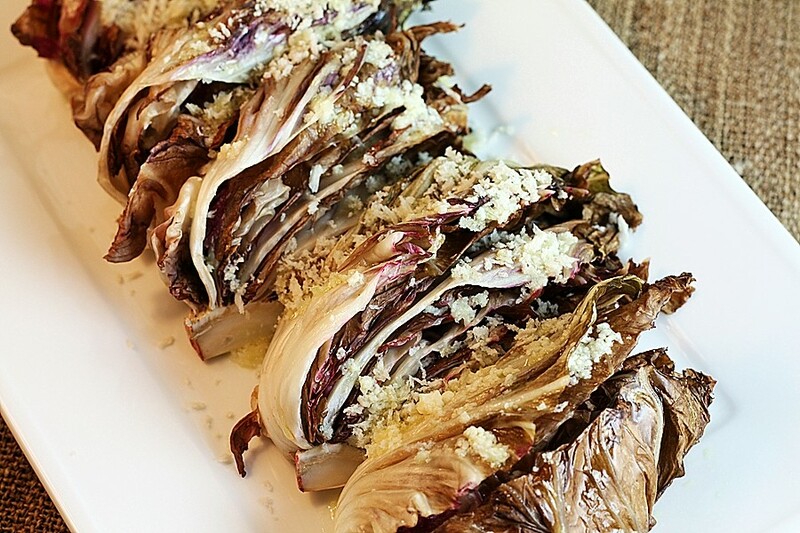 A recipe for Roasted Radicchio with Lemon Vinaigrette and Breadcrumbs. I have to admit, even I was a little weirded out about the whole thing – what are the chances? Ok, I guess it is not unheard of that I have some interesting ingredient in the refrigerator that I am looking to use up – but I truly believe this was the first time I ever had radicchio in the refrigerator, and surely one of the few times when I read a recipe where radicchio was the main ingredient. If you like the bitterness of radicchio, you will love this recipe. The dressing was wonderful, and the breadcrumbs – now, what doesn’t taste better with breadcrumbs? The only thing I didn’t like about the dish was that as soon as the radicchio began roasting, it lost its beautiful purple color. So, sorry for the picture, but this is what it looked like. So if you can move past the appearance, you will love it. Now go get yourself some radicchio. Mix cheese, lemon juice, garlic, minced anchovies, and pinch of sugar in medium bowl. Whisk in olive oil. Season vinaigrette to taste with salt and pepper. DO AHEAD Can be made 1 day ahead. Cover and chill. Bring to room temperature and rewhisk before using. Preheat oven to 350°F. Line rimmed baking sheet with foil. 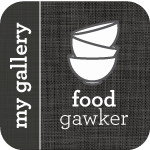 Mix 1 tablespoon olive oil and garlic in medium bowl. Add bread cubes, oregano, and crushed red pepper; sprinkle with salt and pepper. Transfer bread cubes to prepared baking sheet. Bake bread cubes until golden brown, tossing occasionally, about 20 minutes. Cool. Transfer to work surface. Cover with paper towels. Using mallet or rolling pin, crush bread cubes into breadcrumbs. Preheat broiler. Line same baking sheet with fresh sheet of foil. Place radicchio wedges in large bowl. Drizzle remaining 3 tablespoons oil over; sprinkle with salt and pepper and toss to coat. Arrange wedges on prepared sheet. Broil until beginning to brown, about 3 minutes. Using tongs, turn radicchio over, fanning leaves out slightly. Broil until radicchio is soft and beginning to brown with some edges beginning to char, watching carefully to prevent burning, about 2 minutes longer. Return radicchio to same large bowl. Drizzle enough dressing over to coat; toss. Arrange wedges on plates. Sprinkle breadcrumbs over. Top with cheese shavings and serve.